I recently saw the movie “The Giver.” The story is about a seemingly perfect community where “sameness” is prized above anything else. In this world, what people see is drained of all color (literally), individuality is erased, every move is monitored, and the power of choice has disappeared. Without pain there is no sadness. Without passion there is no conflict. Without the power of choice, there is no wrong. This is a utopia that seeks to avoid all suffering and sin. The memories of humanity are passed down through two people, a “giver” and a “receiver.” These two work together to bring back a world full of color, passion and emotion. In the movie, the Chief Elder explains why their utopia felt it was necessary to create a community without pain, suffering, sadness, love, or joy. She said, “When people have the freedom to choose, they choose wrong.” The moment I heard these powerful words of truth, they resonated deep in my heart. Over the last few years, God has taken me on a journey revealing to me more and more about “The Gospel” and what it means to live a life that is “Gospel-centered.” One of the hardest things about living a “Gospel-centered” life is coming face to face with my own depravity, selfishness, and shortcomings. It’s difficult to admit that my heart is ugly and sinful to the core. I grew up in the church, and I regrettably never came face to face with my own depravity like I have recently. Truthfully, I don’t remember learning much about how ugly and distasteful my heart was, especially after I “chose” to follow Jesus. I learned about sinners, why we don’t sin, and what the death of Jesus on the cross saved us from. However, I lacked a full understanding of my own wickedness and the weight of my sin. As Christians, it seems that we rarely discuss and teach on the conditions of our own hearts. As God began to expose the core of my heart, my understanding of God and his grace began to radically change. I lacked a full understanding of my own wickedness and the weight of my sin. When I first began facing the corruption of my own heart, it was difficult to accept. I was devastated when my weaknesses, sins, and failures were exposed to myself, to others, and even to God (as if he didn’t already know). If my husband ever confronted me in love about my impure motives, actions, or unbelief, I would typically respond with disrespect and frustration. I knew I was sinner…but I always believed that I wasn’t “that bad.” As a Christian growing up in the church I believed and I even said things like “no sin is worse than another. God judges the heart.” However, I held the mentality, like many other Christians, that there were “sinners” and then there were “good sinners.” For me, I fell into the category of “good sinner.” Why? Because I grew up going to church on Sundays. I was heavily involved in ministry and faithfully tithed every week. I didn’t drink alcohol. People saw me as a woman of faith and I was a virgin on my wedding night. Being a “good sinner” was only based on the things I did or did not do, not the condition of my heart. God quickly crushed that perspective. I was a sinner to the core (by choice and by nature)…and one of the worst he could ever save. I held the mentality that there were “sinners” and then there were “good sinners.” For me, I fell into the category of “good sinner.” Why? Because I grew up going to church on Sundays. I was heavily involved in ministry and faithfully tithed every week. I didn’t drink alcohol. People saw me as a woman of faith and I was a virgin on my wedding night. It was painful coming to terms with the truth of Genesis 6:5. I felt foolish and embarrassed for living most of my life as a believer with a poor theological understanding and interpretation of scripture. For years, poor teaching and a lack of good theology served only to cause me to have deep unbelief in many eternal truths of who God is. 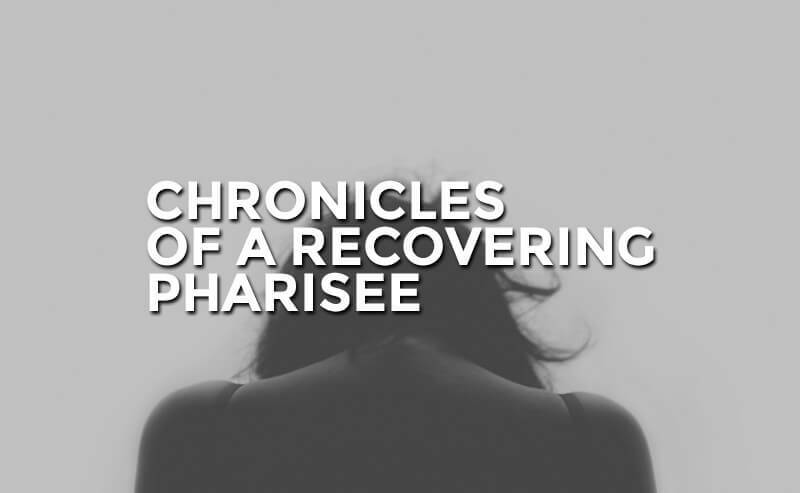 I felt even more shameful when I realized that my life looked more pharisaic than it did Gospel-centered. My understanding of the condition of my heart was weak and deficient. I loved God from the moment he pursued my heart, but I just didn’t know him. I didn’t fully understand why I needed rescuing, what I needed rescuing from, or how God redeemed me through Jesus Christ. God created us to need him. We were fundamentally designed to be needy. Hebrews 3:12-13 says, “See to it, brothers and sisters, that none of you has a sinful, unbelieving heart that turns away from the living God. But encourage one another daily, as long as it is called ‘Today,’ so that none of you may be hardened by sin’s deceitfulness.” This verse helps us understand why we daily need God’s rescuing, redeeming, and resurrection in our lives. Everyday we need to be saved from our own indwelling sin. When Jesus Christ was crucified the power of sin was broken, but the presence of sin still remains. At the foundation of all worship, whether it is true or false, is a heart full of belief. Recognizing the weight of my sin and my deep propensity and desire to chase after god-replacements (my greatest idols) is what brought me to a place to be able to humbly admit that I am a sinner. I am not a “good sinner.” There is no such thing. Like the Chief Elder from the movie “The Giver” says, “people choose wrong.” I am a prideful, selfish, greedy, self-righteous human being and my most natural desire is to sin. Choosing Jesus above everything else is not natural for our hearts. But one thing remains…while I suffer as a sinner, the refrain is that I have been and am being rescued, redeemed and restored by Jesus Christ. Because of the union with Christ in his death and resurrection, we no longer have to live under the control of our flesh. Sin is not our master. Jesus’s death on the cross overcomes the reign of sin. When we fail due to fear and rebellion, God redeems us by pouring out his abundant grace because of his love and mercy for us. There is no moral resume required that shows off our righteous deeds and depths of faith to be finally accepted into the family of God. Jesus Christ woos our hearts and draws us near to him. When we begin placing our story within the context of his story, the greatest story of compassion, love, and rescuing, we will begin understanding who we are and we will live as we were meant to live. Everyday Jesus is greater than our sin because he chose to rescue and redeem our hearts. “God’s grace invites you to be part of something that is far greater than your boldest and most expansive dream. His grace cuts a hole in your self-built prison and invites you to step into something huge, so significant that only one word in the Bible can adequately capture it. That word is glory.” -Paul David Tripp, A Quest For More: Living For Something Bigger Than You.